We hire out wide range of all weather marquees. When you hire a marquee from Weatherill Brothers you get the advantage of more than five decades of experience along with it. 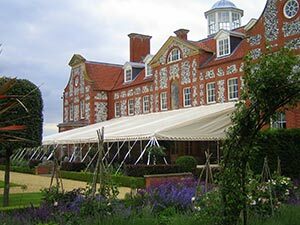 We’ve been making and supplying marquees to people all over Suffolk for 50 years, so there’s not much in the business we haven’t done. With that in mind, we thought we’d pass on some of the vital knowledge that we have acquired that could help you make your big day as good as possible, which can be seen in the section below. Think about your budget carefully. We like to think all our marquees are exceptional value but don’t overstretch yourself in some areas and forget about others. You need a marquee that is size appropriate for your event. Consult with the venue and get a clear idea of how much space you have to play with. We can custom design marquees to fit any size or shape of space but we’ll need to know in advance if there is anything unusual or limitations in place. We know this is probably not the most exciting thing to think about but good access can save a lot of headaches on or near the big day. The last thing you need is to be carrying tonnes of supplies and equipment in the hours before the party starts.